An ideal investment should always offer you a way out, if you are not happy with its performance. Mutual Fund Redemption is a way to make a graceful exit. If the fund is not performing to your satisfaction, you can redeem the units you own. In this article, let us talk about when and how to exit or redeem mutual funds. Why exit a mutual fund? With hundreds of funds out there, it is a difficult choice for an investor to decide which mutual fund to choose. An even more difficult decision is to track the performance and decide when and how to sell off the units. The fund manager invests this money in a wide array of assets – equities, debt securities and/or money market instruments. The ultimate aim is to deliver highest returns possible to the investors. However, different mutual funds have different rules and guidelines for entering, exiting and redemption. So, investors should keep these factors in mind when choosing a fund. The right time to sell or redeem mutual funds depends on investors’ financial goals. One might be invested in a mutual fund for 10-15 years with a purpose of purchasing a house or financing their child’s wedding. It could also be a short-term goal like buying a car or an appliance. If the investor is getting close to that time, one should sell the fund irrespective of the state of the market. Another use case of redemption might be when a fund under-performs consistently for two or more years, and drops down in its accredited ratings. Once the reason for redemption is clear and finalized, just redeem it using any of the below methods. If you have purchased a mutual fund directly from the Asset Management Company (AMC), then you can sell it off from their online portal itself. You can choose to sell some units or all as per your requirement. One can also conduct this process offline by visiting the AMC office. After processing the request, you will receive the redemption amount via NEFT or through a cheque sent to the registered address. Usually the online mode is much faster resulting in the amount being credited in a day or two. If you have bought mutual funds through a Demat account or trading account, then you must process your redemption too through the same. After completing the trading process, they make an electronic payout (NEFT or IMPS) against the redemption request. This way, you can get the amount credited into the same bank account registered with the Demat account. If you have purchased the mutual fund units via an intermediary, then you may sell off through the same entity. In short, the process simply involves filling a duly filled redemption form with the number units to be redeemed. Once they process the request, you will receive the money via NEFT. You may also accept a cheque sent to your address. Some central services likes CAMS and Karvy offer the option of redeeming mutual fund bought from several AMCs. Download a redemption form, and submit it duly filled and signed at the nearest CAMS office. 4. Why do investors redeem mutual fund? An investor may have numerous reasons to invest or sell fund units. You should rationally consider the following aspects before redeeming impulsively. Most of the people invest with a financial goal that commiserates with the fund objective. So, this objective plays an important role in finalizing what funds you want to include in your investment portfolio. However, an active investor tracking the market might sell off or redeem units, if the long-term prospects seem negative. One should not sell just because the markets have touched new highs. Investors should have faith in the professional fund manager’s ability to book profits and cut losses. Financial planners believe it is not possible to time the markets for any investor. Hence, redeeming immediately after a new market high might be a flawed strategy. If your scheme seems to be under-performing for a while now, then you should try and look for reasons for under-performance. If the reason is something like a change of fund manager or drastic change to the portfolio mix – then you might consider fund redemption. To take care of unforeseen events, it is advisable to have some part of one’s portfolio invested in open-ended mutual funds. This ensures liquidity. One should avoid selling off funds that are built to meet a particular goal. And be mindful of the tax implications and exit loads that may apply to your mutual fund. In short, one should invest with a longer investment horizon to reap maximum benefits from flexible funds. Therefore, the underlying aim of the investment should always be wealth creation, capital protection and appreciation. Do not let any other factors guide the redemption decisions. You can easily redeem your mutual funds on ClearTax in the following steps: i. Log in to the Cleartax mutual fund dashboard and select the specific mutual fund you want to redeem. ii. 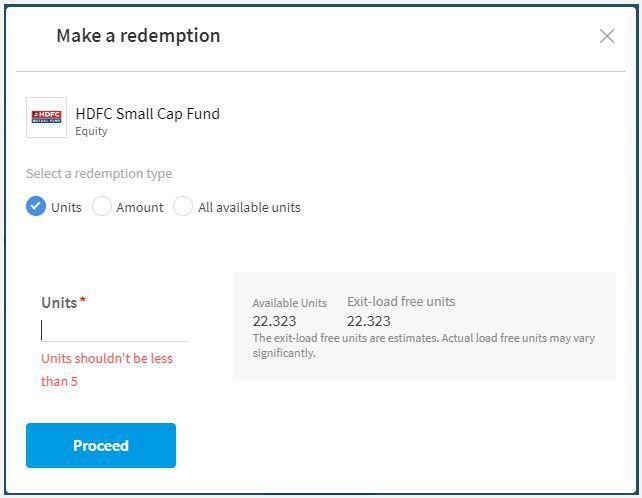 After you select the specific fund you want to redeem, click on the arrow and select redeem. iii. On selecting redeem, you will be routed to the below screen. Select the appropriate options and proceed.